A hand-tufted West Elm rug with a traditional Moroccan pattern set the palette for the entire space. Accessories are lighthearted, not cutesy. We settled on using the space as a guest room/man cave—aka a place for Nick and his PlayStation—but with the appearance of an updated take on a salon. There would be a gallery wall filled with original photography and vintage art, a Milo Baughman–esque distressed leather sofa, a fiddle-leaf fig tree in the corner, and one of those oversize macramé wall hangings that were just beginning to have a serious moment. It would be amazing. Cut to four years later, and the progress we’d made consisted of a pullout couch from Pottery Barn that was generously gifted to us from my parents (complete with a slipcover I never did manage to fit to my satisfaction, despite numerous attempts at studious tailoring with safety pins); a rotating array of throw pillows I’d purchased in desperate, impatient attempts to spruce up the place; two bookshelves left over from my college dorm room; and a corner filled with things we were always just on the verge of getting framed. 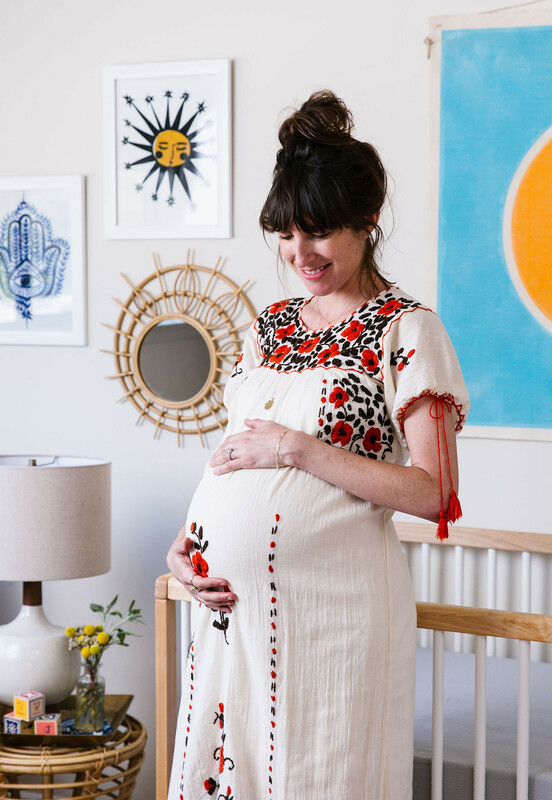 Author Melissa Goldstein in her son's nursery. Textiles provide a soft surface for tummy time. When we found out I was pregnant with a baby boy earlier this year, it was obvious we needed to take action. The room finally had a clear purpose and a timeline—the perfect motivation. But the task at hand was daunting. For starters, we had four years of pent-up hopes for the space. Then there was my desire to decorate it with mainly green, nontoxic, non flame-retardant furniture—no small order. Add to that the occupational hazard, as a design writer, of being constantly bombarded with inspiring displays (Coco Rocha’s makeover with One Kings Lane and aspirational nurseries created by Amber Lewis and DISC Interiors dominated my Pinterest board), and I found myself experiencing a mild case of stage fright. Namely, where to begin? So I teamed up with online interior design service Decorist, who paired me with designer Hilary Ramsay to help me get to grips with the project. 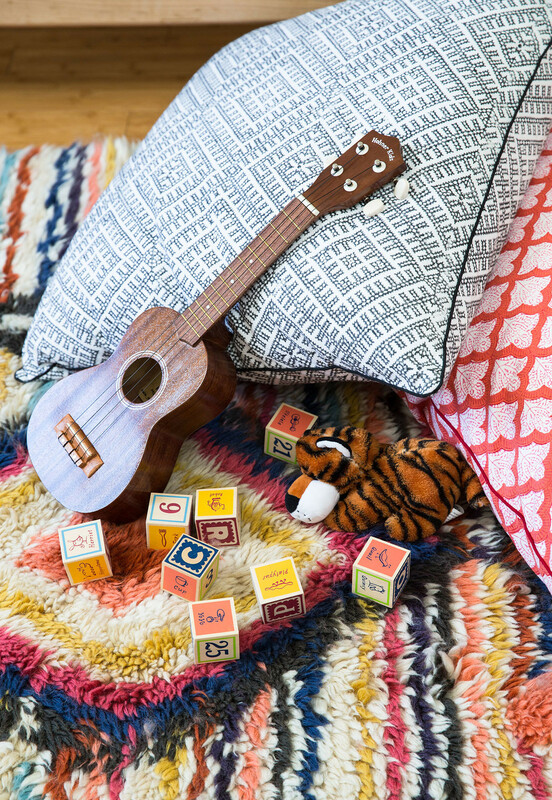 I briefed her on our vision: midcentury meets jet-set bohemian meets budding-intellectual, with the aforementioned “clean” decor and—perhaps unusually for a child’s room—nothing too cutesy or babyish. 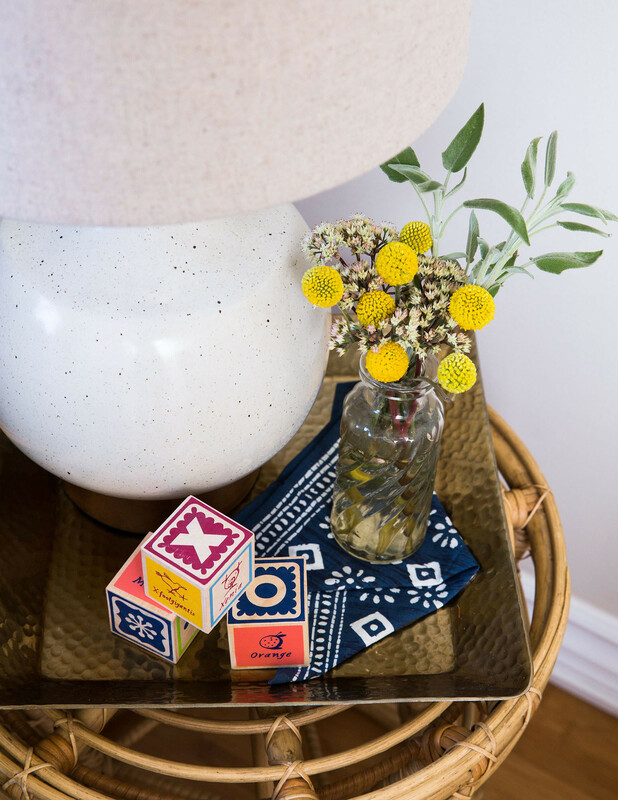 A Moroccan-inspired Charm Wool Rug from West Elm that I’d recently purchased (pre-pregnancy test) fortuitously fit with the scheme and gave us a starting point for a color palette. From there, we set about nailing down the major pieces. I fell instantly in love with Serena & Lily’s white-and-natural Caravan Crib by Kalon Studios, crafted from solid American maple (rather than pressed or engineered wood, which typically contains added formaldehyde) in a whimsical silhouette. Having been assured by my sister of the need for a chair that glides or rocks rather than one that simply looks cool and comfortable, I test-drove and eliminated a few Shabby Chic–feeling numbers that didn’t jive with our look. Then I found the one: Toronto-based Monte Design’s Como Glider, which is filled with natural latex that is free of petrochemicals. The glider comes with a matching ottoman option that glides in concert with the chair, and is made in a refined pebble-gray microfiber and walnut exclusive to Sprout San Francisco, where I also found a dresser: a natural wood–colored future heirloom made by Amish craftsmen at Capretti Design. 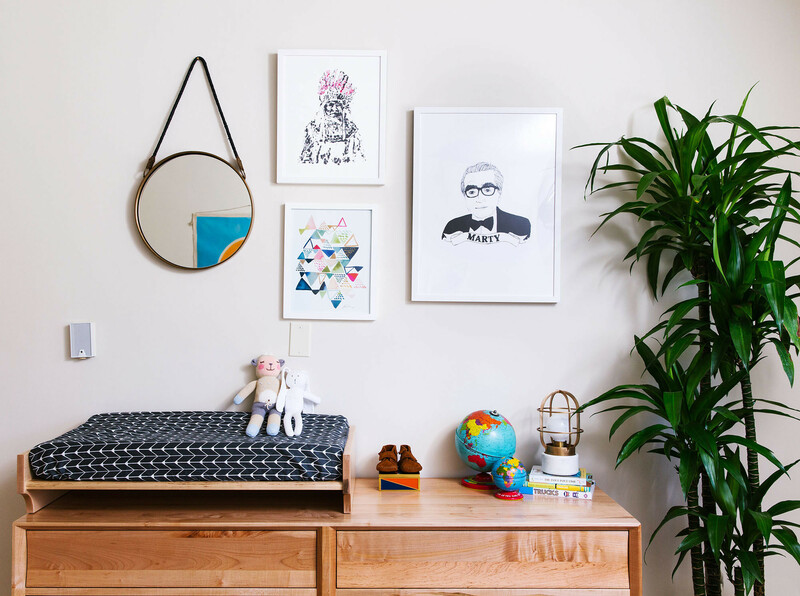 A lovingly curated gallery wall includes works from Tappan Collective and a mirror from Anthropologie. With the furniture in place, it was time to focus on accessories. On the walls, we gravitated toward black-and-white works by Michael Gittes (a Chief Massachusetts print) and Deerdana (a limited-edition Martin Scorsese print) for Tappan Collective; nostalgic, ’70s-feeling pieces by As Collective; and a hanging Sailor’s Mirror with a leather strap from Anthropologie—an eclectic menagerie intended to achieve that longed-for salon scheme, while also subtly nodding to the fact that a tiny male person would soon be residing there. The pièce de résistance? An original painting on canvas, from the Shapes Color series by L.A. artist Ryan Snow, to hang over the crib. 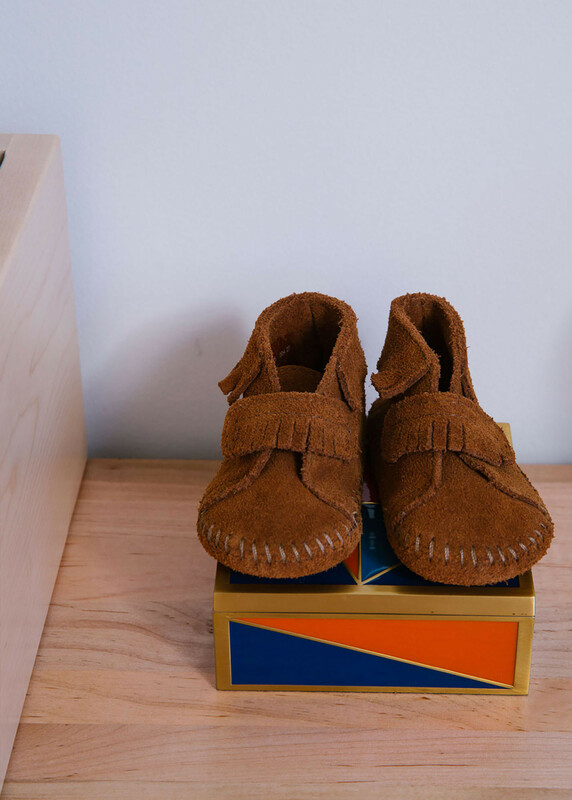 Suede booties await pint-size feet. Bosom buddies keep company on the changing table. To round out the scheme, we added a Room & Board Case Study planter with a bamboo plant for that obligatory dose of greenery, a shibori throw pillow on the glider from Brooklyn-based Upstate, and for lighting, a Mini Industrial Cage Lamp and midcentury-inspired table lamp from West Elm. And to nail a sense of layered texture, as well as offer a respite from the bounty of color, we rounded things out with accents composed of earthy materials: a Magical Thinking Luna Rattan side table from Urban Outfitters, seagrass baskets from Serena & Lily (perfect for holding toys and books, including a felted Bluebird Snooter-doot), and a handmade African storage hamper woven from millet grass from Connected Goods. The size of the room meant that once the crib and dresser and glider were in place, there wasn’t a lot of extra square footage for additional seating options, so we opted for decorative patterned floor pillows from Roberta Roller Rabbit (with custom organic cotton fillers sourced from Etsy shop Island Picnic) to create a flexible and mobile place for visitors to lounge. Finally, to remedy a particularly lackluster window treatment, Ramsay suggested a Cascade Roman shade in ivory linen from the Shade Store—a simple, classic backdrop complete with a blackout lining, to help guarantee better napping. 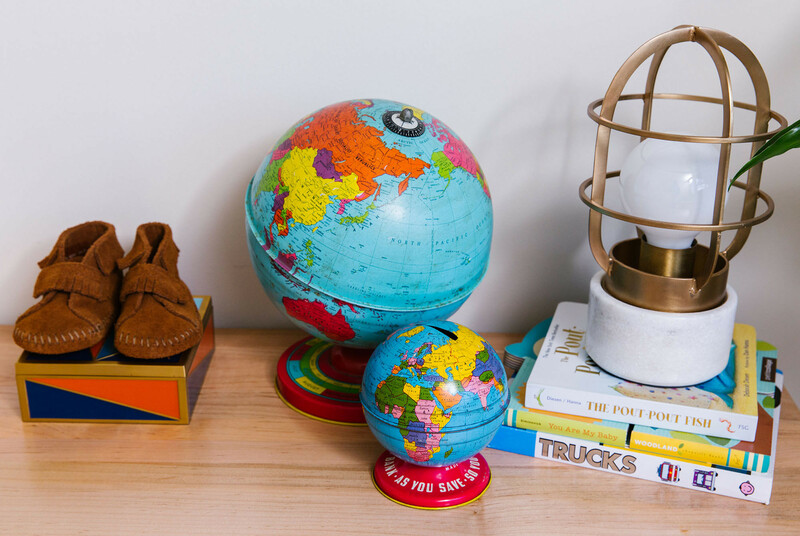 A cage light by West Elm illuminates items on a dresser from Sprout San Francisco. Despite the copious planning, it all came together at the very last minute, with two-and-a-half weeks to go before Baby G was due to make his appearance. (Ed note: Otis Seton Gawith was born at 2 a.m. Tuesday. Mother, father, and child are doing fabulously.) And while the finished result may not mirror the immaculate scenes my day job has accustomed me to behold on a regular basis—there’s not much I can do about our cottage-cheese ceilings, for example—I finally feel we have a place in our house that began as a blank slate and lives up to our vision. 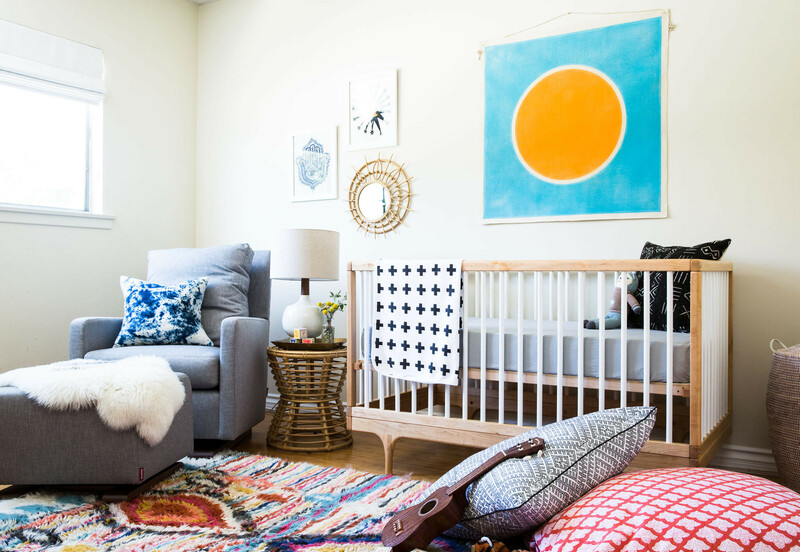 It’s fitting that this nursery marks the first room we truly put together from scratch; after all, it’s a place for someone new.